This package can be used to animate elements of HTML Web pages. It can manage one or more animations that may run in parallel. Each animation is composed of a sequence of steps that apply individual effects to Web page elements. 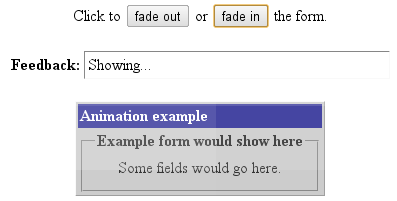 It also supports pseudo-effects for synchronization purposes like cancel a parallel animation, wait a given period of time, or callback a function to execute custom code before or after any animation effect.